Prince absolutely hates when his live performances are bootlegged without his consent, but no one needs to be worried about getting sued over this concert clip of "Something in the Water," since it was shared by his backing band 3rdEyeGirl. The clip was filmed in Manchester around a week ago, on February 22. It shows Prince going guitar-free and leading a sing-along while backed by 3rdEyeGirl. The Purple One eventually grabs an axe and shreds his way through a cloud-scraping solo. 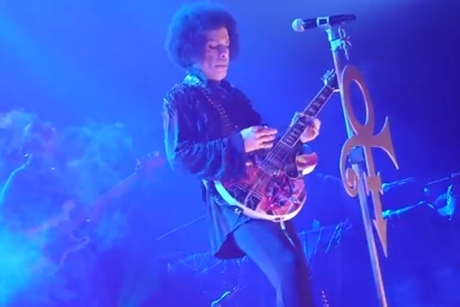 Prince previously shared a live clip of the same song, although the prior one was shorter and featured his other backing band, the New Power Generation. In related news, Prince will be taking over the Arsenio Hall Show on March 5.